^ a b c MET 2015. ^ Allen et al. 1999, pp. 329-330. ^ a b c Redford 2001. ^ a b c Walters Art Museum website 2015. ^ a b c d e Clayton 1994, pp. 60-63. ^ a b c d Rice 1999, p. 173. ^ a b Malek 2000, pp. 83-85. ^ a b c d e f g h i Baker 2008, pp. 343-345. ^ a b Sowada 2009, p. 3. ^ a b von Beckerath 1999, p. 283. ^ a b Hornung 2012, p. 491. ^ Allen et al. 1999, p. 337. ^ a b Leprohon 2013, p. 38. ^ a b Dodson & Hilton 2004, pp. 62-69. ^ El Awady 2006a, pp. 214-216. ^ a b c d e f g h i j Lehner 2008, pp. 142-144. ^ a b Brinkmann 2010. ^ a b Hayes 1978, pp. 66-68 & p. 71. ^ a b Lichteim 2000, pp. 215-220. ^ a b c d El Awady 2006a, pp. 192-198. ^ a b Labrousse & Lauer 2000. ^ Verner 2002, p. 268. ^ a b El Awady 2006a, pp. 208-213. ^ El Awady 2006a, pp. 213-214. ^ El Awady 2006a, pp. 198-203. ^ von Beckerath 1999, pp. 56-57. ^ Wilkinson 2000, p. 259. ^ Breasted 1906, p. 70. ^ Verner 2001, p. 391. ^ a b Wilkinson 2000, p. 168. ^ a b Gardiner, Peet & Černý 1955, p. 15. ^ Sethe 1903, p. 32. ^ Hayes 1978, pp. 66-67. ^ Sowada 2009, p. 160 and Fig. 39. ^ Smith 1971, p. 233. ^ Smith 1965, p. 110. ^ Sowada 2009, p. 198. ^ Hawass 2003, pp. 260-263. ^ Wachsmann 1998, p. 12. ^ Strudwick 2005, p. 135, text number 57. ^ Mumford 1999, pp. 875-876. ^ a b c Breasted 1906, pp. 108-110. ^ Baines 2011, pp. 65-66. ^ Kuiper 2010, p. 48. ^ a b c Verner & Zemina 1994, p. 110. ^ Verner 2012, pp. 16-19. ^ Verner 2003, p. 150. ^ Smith 1971, p. 167. ^ Petrie Museum, online catalog, seal UC 21997 2015. ^ Petrie Museum, online catalog, seal UC 11769 2015. ^ List of attestations of Sahure 2000. ^ Krecji 2003, p. 281. ^ Borchardt 1910, p. Plate (Blatt) 9. ^ El Awady 2006b, p. 37. ^ Edwards 1972, pp. 175-176, 180-181 & 275. ^ a b Breasted 1906, pp. 108-109. ^ Ghaliounghui 1983, p. 69. ^ Sethe 1903, p. 38. ^ Sethe 1903, p. 48. ^ Breasted 1906, pp. 109-110. ^ Lauer & Flandrin 1992, p. 122. ^ :en:Online catalog of the British Museum. ^ Sethe 1903, p. 40. ^ a b c Schneider 2002, pp. 243-244. ^ List of viziers 2000. ^ a b c Wildung 2010, pp. 275-276. ^ Allen et al. 1999, pp. 456-457. ^ Hayes 1978, p. 106. ^ Sethe 1903, p. 36. ^ Junker 1950, pp. 107-118. ^ Allen et al. 1999, p. 404. ^ Strudwick 2005, p. 248, text number 173. ^ Sethe 1903, p. 33. ^ Hayes 1978, p. 68. ^ a b Wildung 1969, pp. 60-63. ^ Legrain 1906, pp. 4-5 & pl. III. ^ Legrain 1906, pp. 3-4. ^ Wildung 1969, p. 170. ^ Verner 2001, p. 393. ^ Borchardt 1910, p. 101. ^ Wildung 1969, p. 198. Allen, James; Allen, Susan; Anderson, Julie; Arnold, Arnold; Arnold, Dorothea; Cherpion, Nadine; David, Élisabeth; Grimal, Nicolas et al. (1999). Egyptian Art in the Age of the Pyramids. New York: The Metropolitan Museum of Art. OCLC 41431623. http://www.metmuseum.org/research/metpublications/Egyptian_Art_in_the_Age_of_the_Pyramids. Baines, John (2011). “Ancient Egypt”. In Feldherr, Andrew; Hardy, Grant. The Oxford History of Historical Writing, Volume 1: Beginnings to AD 600. Oxford: Oxford University Press. ISBN 978-0-19-103678-1. https://books.google.com/books?id=pYM3AwAAQBAJ&pg=PA65&lpg=PA65&dq=Newly+discovered+blocks+from+the+causeway+of+Sahure&source=bl&ots=ubGQVVcVMx&sig=x1zusaiannwK4VZYrhFsRmTKoQk&hl=en&sa=X&ei=EW0xVO71C83dauaxgJAJ&ved=0CEkQ6AEwCA#v=onepage&q=Sahure&f=false. von Beckerath, Jürgen (1999) (German). Handbuch der ägyptischen Königsnamen. Münchner ägyptologische Studien, Heft 49, Mainz : Philip von Zabern. ISBN 978-3-8053-2591-2. Borchardt, Ludwig (1910) (German). Das Grabdenkmal des Königs S'aḥu-Re (Band 1): Der Bau: Blatt 1-15. Leipzig: Hinrichs. ISBN 978-3-535-00577-1. http://digi.ub.uni-heidelberg.de/diglit/borchardt1913bd2b?sid=581395ce99fcb4e7511b5ea7bea65b1b. Breasted, James Henry (1906). Ancient records of Egypt historical documents from earliest times to the Persian conquest, collected edited and translated with commentary, vol. I The First to the Seventeenth Dynasties. The University of Chicago Press. OCLC 491147601. https://archive.org/details/BreastedJ.H.AncientRecordsEgyptAll5Vols1906. Brinkmann, Vinzenz, ed (2010) (German). Sahure: Tod und Leben eines grossen Pharao. Frankfurt am Main: Liebieghaus. ISBN 978-3-7774-2861-1. http://www.liebieghaus.de/lh/index.php?StoryID=357. Clayton, Peter (1994). Chronicle of the Pharaohs. Thames & Hudson. ISBN 978-0-500-05074-3. https://archive.org/details/ChronicleOfThePharaohsBySamySalah. Dodson, Aidan; Hilton, Dyan (2004). The Complete Royal Families of Ancient Egypt. Thames & Hudson. ISBN 978-0-500-05128-3. Edwards, I. E. S. (1972). The Pyramids of Egypt. New York: Viking Press. ISBN 978-0-67-058361-4. El Awady, Tarek (2006). “The royal family of Sahure. New evidence.”. In Bárta, Miroslav; Krejčí, Jaromír. 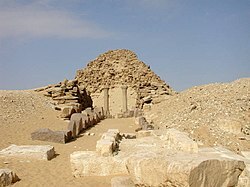 Abusir and Saqqara in the Year 2005. Prague: Academy of Sciences of the Czech Republic, Oriental Institute. ISBN 978-80-7308-116-4. http://egyptologie.ff.cuni.cz/pdf/AS%202000_mensi.pdf. El Awady, Tarek (2006). “King Sahure with the Precious Trees from Punt in a Unique Scene!”. In Bárta, Miroslav. The Old Kingdom Art and Archaeology, Proceedings of the conference held in Prague, May 31 - June 4, 2004. Prague: Czech Institute of Egyptology, Faculty of Arts, Charles University in Prague: Publishing House of the Academy of Sciences of the Czech Republic. ISBN 978-8-02-001465-8. Gardiner, Alan Henderson; Peet, Thomas Eric; Černý, Jaroslav (1955). The Inscriptions of Sinai, edited and completed by Jaroslav Cerný. London: Egypt Exploration Society. OCLC 559072028. Ghaliounghui, Paul (1983). The Physicians of Pharaonic Egypt. Cairo: A.R.E. : Al-Ahram Center for Scientific Translations. ISBN 978-3-8053-0600-3. Hawass, Zahi (2003). The Treasure of the Pyramids. White Star. ISBN 978-88-8095-233-6. Hayes, William (1978). The Scepter of Egypt: A Background for the Study of the Egyptian Antiquities in The Metropolitan Museum of Art. Vol. 1, From the Earliest Times to the End of the Middle Kingdom. New York: Metropolitan Museum of Art. OCLC 7427345. http://www.metmuseum.org/research/metpublications/The_Scepter_of_Egypt_Vol_1_From_the_Earliest_Times_to_the_End_of_the_Middle_Kingdom. Hornung, Erik; Krauss, Rolf; Warburton, David, eds (2012). Ancient Egyptian Chronology. Handbook of Oriental Studies. Leiden, Boston: Brill. ISBN 978-90-04-11385-5. ISSN 0169-9423. https://archive.org/details/AncientEgyptianChronology. Junker, Hermann (1950) (German). Giza. 9, Das Mittelfeld des Westfriedhofs. Akademie der Wissenschaften in Wien. Philosophisch-historische Klasse, 73.2. Wien: Rudolf M. Rohrer. OCLC 886197144. https://archive.org/download/gzaberichtbe09junk/gzaberichtbe09junk.pdf. Khaled, Mohamed Ismail (2013). “The Economic Aspects of the Old Kingdom Royal Funerary Domains”. Etudes et Travaux XXVI. Kuiper, Kathleen (2010). Ancient Egypt: From Prehistory to the Islamic Conquest. Britannica Guide to Ancient Civilizations. Chicago: Britannica Educational Publishing. ISBN 978-1-61530-572-8. https://archive.org/details/AncientEgypt-FromPrehistoryToTheIslamicConquest. Krecji, Jaromir (2003). “Appearance of the Abusir Pyramid Necropolis during the Old Kingdom”. In Hawass, Zahi; Pinch Brock, Lyla. Egyptology at the dawn of the Twenty-first Century: proceedings of the Eighth International Congress of Egyptologists, Cairo, 2000. Cairo, New York: American University in Cairo Press. ISBN 978-9-77-424674-6. https://books.google.com/books?id=1E13DorsFMEC&pg=PA281&dq=Sahure&hl=en&sa=X&ei=jBM0VKDXFcPxaOjogogF&ved=0CE4Q6AEwCA#v=onepage&q=Sahure&f=false. Labrousse, Audran; Lauer, Jean-Philippe (2000) (French). Les Complexes Funéraires d'Ouserkaf et de Néferhétepès. Bibliothèque d'étude, Vol. 130. Cairo: Institut français d'archéologie orientale. ISBN 978-2-7247-0261-3. Lauer, Jean-Phillipe; Flandrin, Philippe (1992) (French). Saqqarah, une vie: entretiens avec Philippe Flandrin. Petite bibliotheque Payot, 107. Paris: Payot. ISBN 978-2-22-888557-7. Legrain, Georges (1906) (French). Statues et statuettes de rois et de particuliers. Catalogue Général des Antiquités Egyptiennes du Musée du Caire. Cairo: Imprimerie de l'Institut français d'archéologie orientale. OCLC 975589. http://www.cfeetk.cnrs.fr/fichiers/Documents/Ressources-PDF/documents/K780-LEGRAIN.pdf. Leprohon, Ronald J. (2013). The great name: ancient Egyptian royal titulary. Writings from the ancient world, no. 33. Atlanta: Society of Biblical Literature. ISBN 978-1-58-983736-2. https://books.google.com/books?hl=fr&id=1H3JAgAAQBAJ&q=Nebsenre#v=snippet&q=Nebsenre&f=false. Lehner, Mark (2008). The Complete Pyramids. London: Thames & Hudson Ltd.. ISBN 978-0-500-05084-2. Malek, Jaromir (2000). “The Old Kingdom (c.2160-2055 BC)”. In Shaw, Ian. The Oxford History of Ancient Egypt. Oxford University Press. ISBN 978-0-19-815034-3. Mumford, G. D. (1999). “Wadi Maghara”. In Bard, Kathryn A.; Blake Shubert, Steven. Encyclopedia of the Archeology of Ancient Egypt. New York: Routledge. ISBN 978-0-203-98283-9. Redford, Donald B. (2001). The Oxford Encyclopedia of Ancient Egypt, Volume 2. Oxford University Press. ISBN 978-0195102345. Schneider, Thomas (2002) (German). Lexikon der Pharaonen. Düsseldorf: Patmos Albatros Verlag. ISBN 978-3-49-196053-4. Sethe, Kurt Heinrich (1903) (German). Urkunden des Alten Reichs. wikipedia entry: en:Urkunden des Alten Reichs. Leipzig: J.C. Hinrichs. OCLC 846318602. http://www.egyptologyforum.org/EEFUrk.html. Smith, William Stevenson (1965). Interconnections in the Ancient Near-East: A Study of the Relationships Between the Arts of Egypt, the Aegean, and Western Asia. New Haven: Yale University Press. OCLC 510516. Smith, William Stevenson (1971). “The Old Kingdom of Egypt and the Beginning of the First Intermediate Period”. In Edwards, I. E. S.; Gadd, C. J.; Hammond, N. G. L.. The Cambridge Ancient History, Volume 1, Part 2. Early History of the Middle East (3rd ed.). London, New york: Cambridge University Press. OCLC 33234410. https://books.google.com/books?id=slR7SFScEnwC&pg=PA167&dq=Sahure+navy&hl=en&sa=X&ei=LKQ1VMK8IIXhywObyoCQCw&ved=0CEIQ6AEwBA#v=onepage&q=Sahure&f=false. Sowada, Karin N. (2009). Egypt in the Eastern Mediterranean During the Old Kingdom: An Archaeological Perspective. Eisenbrauns. ISBN 978-3-7278-1649-9. https://books.google.com/books?id=bwJe63dlNxUC&pg=PA160&dq=Sahure&hl=en&sa=X&ei=lBc0VMmoEIbVPL6sgLgI&ved=0CEkQ6AEwCDgK#v=onepage&q=Sahure&f=false. Strudwick, Nigel C. (2005). Texts from the Pyramid Age. Writings from the Ancient World (book 16). Atlanta: Society of Biblical Literature. ISBN 978-1-58983-680-8. https://books.google.com/books?id=sgoVryxihuMC&printsec=frontcover&source=gbs_ge_summary_r&cad=0#v=onepage&q=Sahure&f=false. Tallet, Pierre (2012). “Ayn Sukhna and Wadi el-Jarf: Two newly discovered pharaonic harbors on the Suez Gulf”. British Museum Studies in Ancient Egypt and Sudan 18. http://www.britishmuseum.org/PDF/Tallet.pdf. Verner, Miroslav; Zemina, Milan (1994). Forgotten pharaohs, lost pyramids: Abusir. Praha: Academia Škodaexport. ISBN 978-80-200-0022-4. http://egyptologie.ff.cuni.cz/pdf/Forgotten%20Pharaohs,%20Lost%20Pyramids.pdf. Verner, Miroslav (2001). “Archaeological Remarks on the 4th and 5th Dynasty Chronology”. Archiv Orientální 69 (3): 363-418. http://www.gizapyramids.org/pdf_library/verner_archiv_or_69.pdf. Verner, Miroslav (2002). The Pyramids. The Mystery, Culture, and Science of Egypt's Great Monuments. Translated by Steven Rendall. New York: Grove Press. ISBN 978-0-8021-3935-1. Verner, Miroslav (2003). Abusir: The Realm of Osiris. The American University in Cairo Press. ISBN 978-977-424-723-1. https://books.google.com/books?id=9lVfAHXvxSMC&printsec=frontcover&source=gbs_ge_summary_r&cad=0#v=onepage&q&f=false. Verner, Miroslav (2012). “Betrachtungen zu den königlichen Palästen des Alten Reiches” (German). Sokar 24. Wachsmann, Shelley (1998). Seagoing Ships and Seamanship in the Bronze Age Levant. College Station: Texas A & M University Press. ISBN 978-0-89096-709-6. https://books.google.com/books?id=apna4pv7Ks8C&pg=PA12&dq=Sahure&hl=en&sa=X&ei=jBM0VKDXFcPxaOjogogF&ved=0CEgQ6AEwBw#v=onepage&q=Sahure&f=false. Wildung, Dietrich (1969) (German). Die Rolle ägyptischer Könige im Bewusstsein ihrer Nachwelt. Münchner ägyptologische Studien, 17. Berlin: B. Hessling. OCLC 5628021. Wildung, Dietrich (2010). “Das Nachleben des Sahure”. In Brinkmann, Vinzenz (German). Sahure: Tod und Leben eines grossen Pharao. Frankfurt am Main: Liebieghaus. ISBN 978-3-7774-2861-1. http://www.liebieghaus.de/lh/index.php?StoryID=357. Wilkinson, Toby (2000). Royal Annals of Ancient Egypt. Columbia University Press. ISBN 978-0-7103-0667-8.